Here you go! Even more missing addend worksheets! 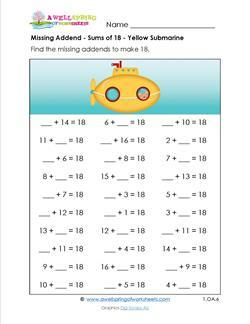 These worksheets provide targeted yet differentiated practice for sums of 16 through 20. 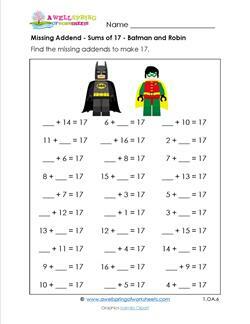 Each worksheet has one targeted sum and they have 12, 15, 24 or 30 problems per page. Every sum has one specific graphics theme – transportation, Lego superheros, under the sea, circus animals, and mice that love strawberries. Use for simply practicing facts (a great tutoring tool! 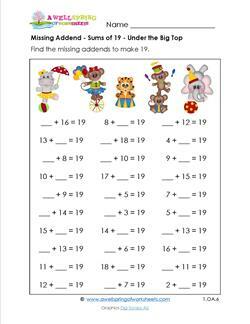 ), in leveled math centers, or as a math time filler. 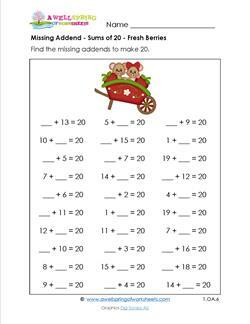 30 worksheets, 6 for each sum. 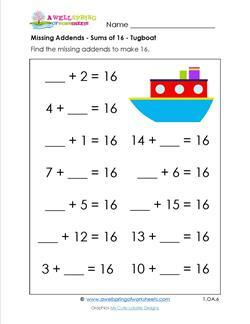 Please go to this page to see more first grade addition worksheets. Keep your feet on the ground and your head out of the clouds! 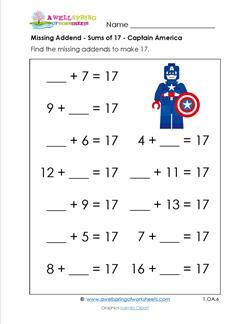 You could get carried up, up, and away while finding each missing addend on this worksheet. 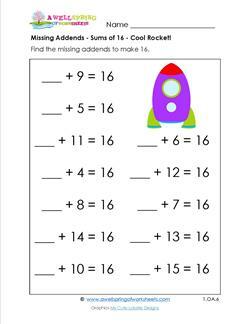 Shoot for the stars with this simple missing addends worksheet! 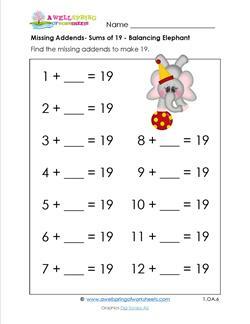 Fill in each missing addend in these 12 problems. All problems have a sum of 16. While you're finding each missing addend, just keep tuggin' along! Don't give up! 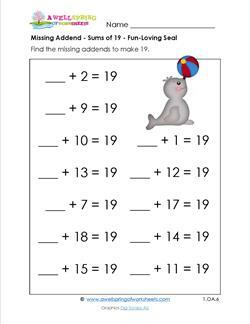 This worksheet only has 12 problems for you to solve. You will be flyin' high as you fill in each missing addend. Just don't get carried away. There are only 15 problems, though I know you'd love to solve more! 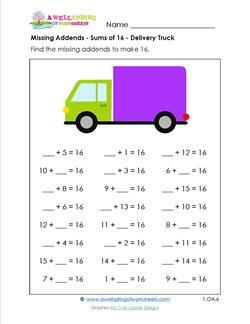 Just pulling in to deliver this missing addend worksheet with sums of 16. 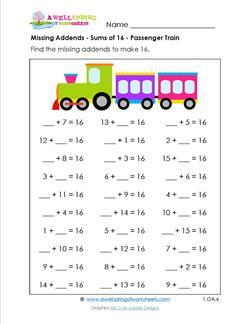 Sign your name and these 24 problems with sums of 16 are all yours! Chugga, chugga, choo, choo! This train is goin' for a ride! Can you solve all 30 of these missing addend problems? 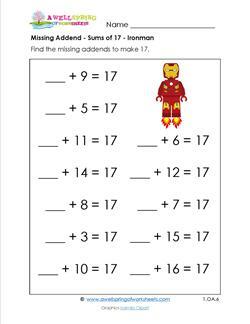 Here's a clue - all sums are 16. He's a superman with super powers ... he's Superman! No, the superman is really YOU doing super human things like this missing addend worksheet! Don't let the stress of doing these 24 missing addend problems turn you into something big and green and ugly! Power through these sums of 17. Be a shining star! Put all your effort into finding the missing addend in each of these 12 missing addend problems. They all have the same sum - 18. While you're working these 12 missing addend problems you'll have these curious little eyes (which, by the way, move in separate directions) looking on. 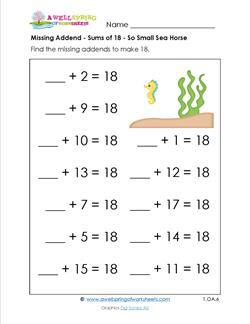 Missing Addend – Sums of 18 – Swimming Underwater! 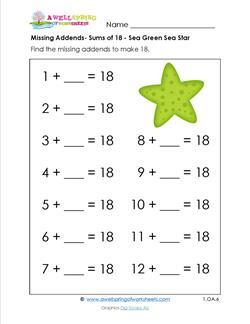 Finding each missing addend in these 15 problems can be as fun as searching for seashells on the seashore - only you won't get all sandy! 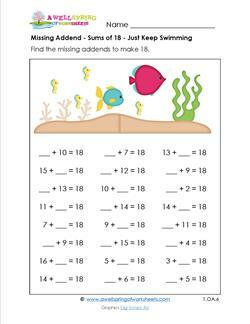 Just keep swimming along and following your school ... find each missing addend in these 24 problems with sums of 18 - a great way to practice addition facts! We all live in a yellow submarine, ... well at least this little fella does ... and he's watching you find each missing addend! 30 problems. Filling in each missing addend sure is a balancing act! 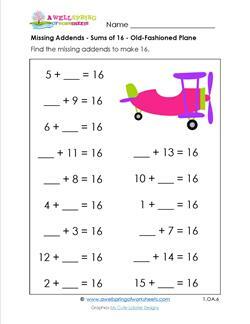 Make sure each of these 12 sets of addends adds up to the sum of 19. Bark! Bark! Barking and bouncing a ball ... that's what seals do. And they have fun while they're doing it, just like I'm sure you'll have while filling in each missing addend! C'mon, get with it! 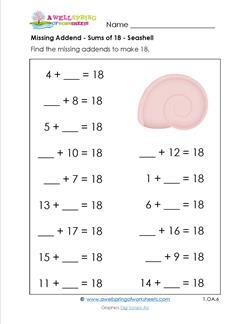 Get "on the ball" and fill in these missing addends with sums of 19. 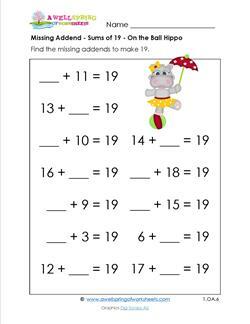 The first or second addend is missing in these 12 problems. A lion sits on his star studded drum, but YOU are really the star of the show. Show us what you've got! 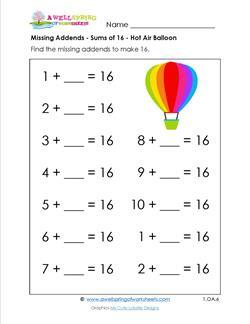 Fill in each of these 15 missing addend problems. 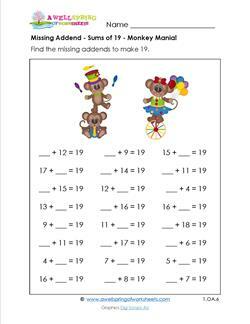 Missing Addend – Sums of 19 – Monkey Mania! Quit monkeying around! Get serious and get some serious smarts! Each missing addend problem in these 24 problems is sure to make you that much smarter. This missing addend worksheet with 30 problems and sums of 19 is only for the serious and undistracted. Why? There's a lot going on under the big top! Just as this mouse wouldn't dare leave one single berry behind, so too, you wouldn't dare leave one single missing addend problem undone ... would you? 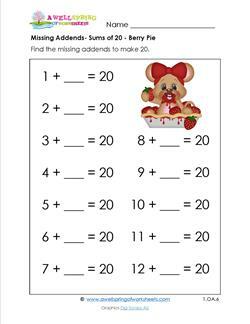 Missing Addend – Sums of 20 – My Berry! This cute little guy is pretty selfish about his berry, just like I know you'll be about the 12 missing addend problems on this worksheet! Do you look forward to the sweetness of Grandma's homemade berry preserves? Well, I preserved each missing addend just for you! 12 sweet problems! 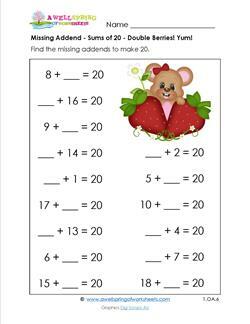 Missing Addend – Sums of 20 – Double Berries! Yum! 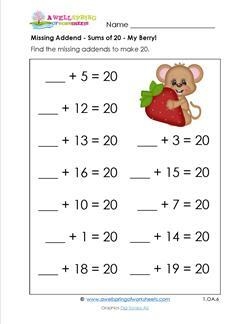 Just like I want to share this missing addend worksheet with you, this little mouse wants to share her berries, too! 15 yummy problems. 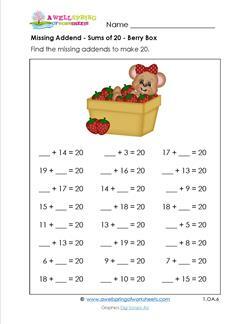 Wouldn't you like to jump into this missing addend worksheet like this mouse has jumped into this basket of berries? Bring it on! 24 problems. Need a challenge? 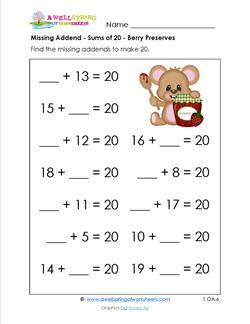 Try filling in these 30 missing addend problems with all the correct answers before the mice can eat the berries. Ready, set ... GO!